Rochester Midland has partnered with a long list of breweries that we are proud to call our customers. We appreciate that the single most important component of a brewery operation is the taste of the final product. A proper sanitation program is integral to standardizing the process to ensure product consistency once that perfect brew is found. Other components affect profitability such as microbiological controls, safety, operational efficiency, preservation of equipment, and water use. 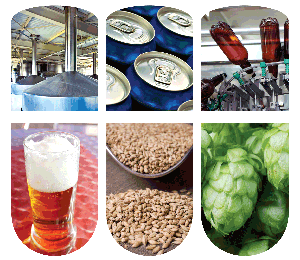 Our HACCP-based BrandGuard® program was designed to support breweries in protecting the brand and profitability through the application of proven food science techniques in the operation. Rochester Midland provides the products, services, training, equipment, knowledge and passion for the industry to ensure that a sanitation program is at its best, and that customers will be cheering for the product for years to come. To complement the BrandGuard program, we also offer water management solutions for boilers, cooling and waste. For information please see Total Water Management.